I can’t quite put my finger on it, but for some reason this photo speaks to me. I don’t know if it’s because this boy is trying so hard – you don’t know if he really knows how to play or if a horrendous screech is flowing from the horn. 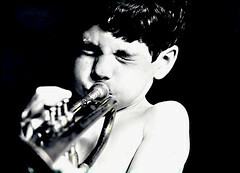 Perhaps it’s the determination on his face – he wants so bad to play the horn well. I think that every child has this kind of determination to do something – maybe it’s to throw a baseball or ace a spelling test. Whatever it is, it’s fabulous! These are my musings about food, art, decorating, travel and more.